Are you sick of CicLAvia? Me neither. What a great celebration. The car-free event that closed 10 miles of streets in downtown L.A. and beyond, lured people off of their couches and into the outdoors to experience our city streets and spirit. And, as reported in The Source yesterday, Metro Board Chair Mayor Antonio Villaraigosa announced a $16 million bike sharing program for downtown L.A., Hollywood, Playa Del Rey, Westwood and Venice Beach. Good for the soul and good for the body. And speaking of the American physique, we are not in good shape and we know it. And here’s one reason why. Americans now walk the least of any industrialized nation in the world. No wonder we have health problems. And yes, walking to a subway station or bus stop counts and it’s a healthy way to start and end the day. This morning’s news seems to be bike obsessed but maybe that’s okay for an active change of pace. 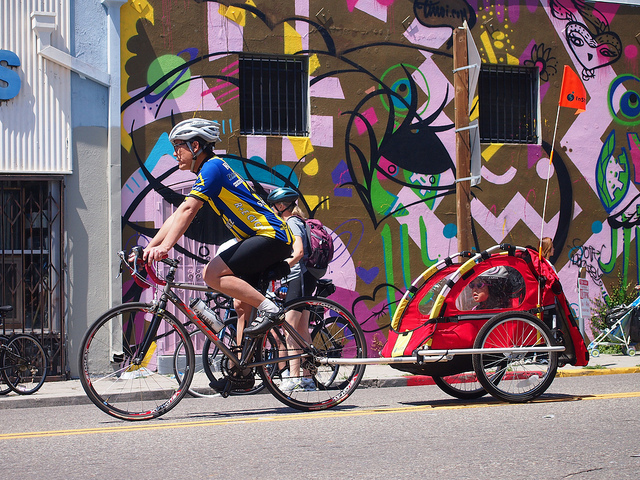 Neon Tommy, the USC Annenberg Digital News Site, has some nice shots of CicLAvia. It’s great to see so many different styles of folks out riding and walking, including some very sweet dogs. L.A. Weekly has an interesting review of a new book “Car-Free Los Angeles and Southern California” by Nathan Landau, calling it a door-to-door guidebook to seeing Los Angeles without getting behind the wheel. “From how to get to the airport (FlyAway!) to planning your route (Metro Trip Planner!) to riding the bus to the Getty (without parking, admission is free!) to getting to Disneyland by transit (it’s possible! ), the detailed transit directions for hundreds of Southern California destinations makes a car-less visit feel possible. And, dare I say, enjoyable.” Check out the review and/or check out the book. It sounds like a good read for transit riders and those who would like to be. And by the way, the Disneyland express bus is the Metro 460 from downtown L.A. or the Green Line Norwalk Station. Unfortunately I think the writer’s views are a bit old-fashioned, or maybe it’s just that she was biased by the personality of her car-free date. Ciclavia seemed to be a huge success. My only suggestion is that Metro, like MetroLink, should consider having full cars dedicated to bikes on days like this (Maybe even all of the time). I had a bit of a clostrophobic sting with all of the bikes and people on the trains blocking the subway doors, and i could tell it was a bit uncomfortable for the average rider. It also seems that many with bikes did not use the dedicated spaces on the trains for bikes, strollers, etc. Yeah, I noticed the red line was fairly packed yesterday, many folks with bikes for CicLAvia, which was good to see as it is evidently a popular event. Also (a bit off topic but relevant to car-free LA), having now used the dodger stadium express, I must say that I think metro handles it fairly well and with good frequency and making it fairly easy to find. The buses were crowded meaning that its a very popular service and that’s a very good sign. But, while the queuing of buses to leave the ballpark seemed logical, I felt they could have loaded each queued bus simultaneously as opposed to one patron line for just the first waiting bus. But every time the bus went over the slightest bump or imperfection in the roadway, the bus would thud loudly startling everybody. Either fix the shocks or reduce the weight by not crowding so many people into one bus. And while the trip up to the ballpark did not take long, coming back took over twice as long as that due to a lack of dedicated bus lanes in and around the park exit/entrance. I think that could be fixed by the owners of Dodger Stadium or maybe an agreement between Metro and it.